While preparing the post about Adaptive Joins, I’d like to share a quick post about the hidden gem in SQL Server 2017 CTP 2.0, discovered recently. 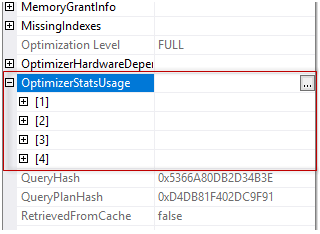 In this short post, we will look at how you can determine what statistics are used by the optimizer during a plan compilation in SQL Server 2017. 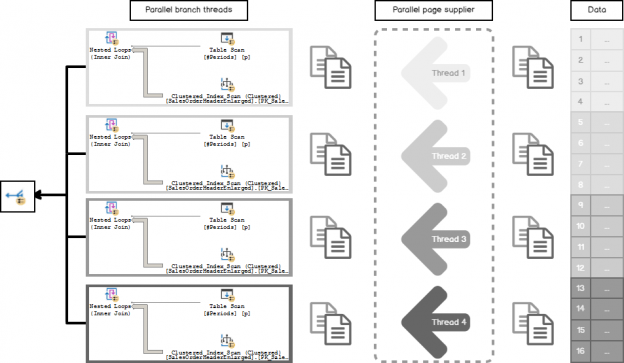 Prior to SQL Server 2017, there were two ways how you could do it, both undocumented and involving undocumented trace flags. In this post, we are going to look at the new feature in SQL Server 2017 – interleaved execution. You need to install SQL Server 2017 CTP 1.3 to try it, if you are ready, let’s start. Now, when a CTP 2.0 of SQL Server 2017 is out, you don’t need to turn on the undocumented TF described further, and the plans are also different, so the examples from this post use CTP.1.3, probably not actual at the moment (I was asked to hold this post, until the public CTP 2 is out, and interleaved execution is officially announced). However, the post demonstrates Interleaved execution details and might be still interesting. Nowadays a lot of developers use Object-Relational Mapping (ORM) frameworks. ORM is a programming technique that maps data from an object-oriented to a relational format, i.e. it allows a developer to abstract from a relational database (SQL Server, for example), use object-oriented language (C#, for example) and let an ORM to do all the “talks” to a database engine by generating query texts automatically. ORMs are not perfect, especially if they are used in a wrong way. Sometimes they generate inefficient queries, e.g. a query with redundant expressions. SQL Server has a mechanism to struggle with that inefficiency called a query simplification. In this post, I continue the exploration of SQL Server 2017 and we will look at the nonclustered columnstore index updates. Columnstore index has some internal structures to support updates. In 2014 it was a Delta Store – to accept newly inserted rows (when there will be enough rows in delta store, server compresses it and switches to Columnstore row groups) and a Deleted Bitmap to handle deleted rows. In 2016 there are more internal structures, Mapping Index for a clustered Columnstore index to maintain secondary nonclustered indexes and a deleted buffer to speed up deletes from a nonclustered Columnstore index. Updates were always split into insert + delete. But that is now changed, if a row locates in a delta store, now inplace updates are possible. Another change is that it is now possible to have a per row (narrow) plan instead of per index (wide) plan. Some time ago, SQL Server 2017 was released and issued as CTP. The most exciting release in that CTP was that SQL Server now supports Linux! This is awesome and I consider it to be great news for many people. I am personally interested in the new features of query processing, and finally I had some time to install the SQL Server 2017 and dig a little bit into it. 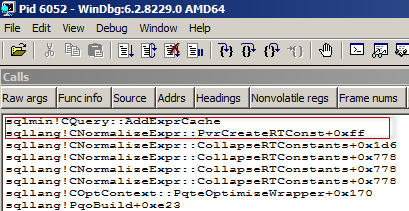 Currently, it is CTP 1.2 available, and I will use this version for my experiments. While exploring new extended events, I’ve found an interesting event compilation_stage_statistics and one of the columns of this event was trivial_plan_scanning_cs_index_discarded with the following description “Number of trivial plans discarded or could have been discarded which scan Columnstore index”. That pushed me to do some investigations of the topic. 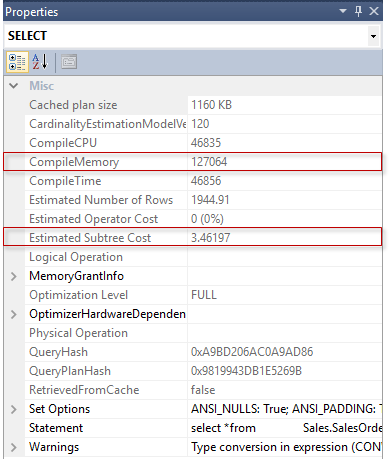 In this post, we will continue to look at the cardinality estimation changes in SQL Server 2016. This time we will talk about scalar UDF estimation. Scalar UDFs (sUDF) in SQL Server have quite bad performance and I encourage you try to avoid them in general, however, a lot of systems still use them. In this post we continue looking at the Cardinality Estimator (CE). 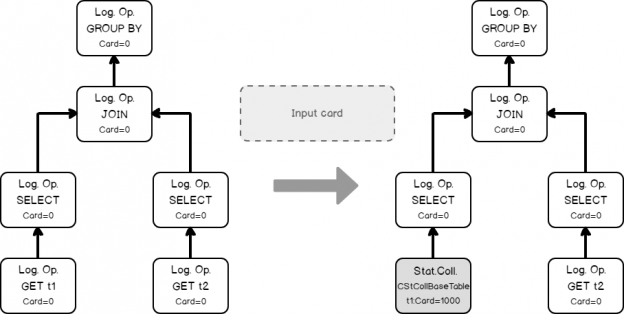 The article explores some join estimation algorithms in the details, however this is not a comprehensive join estimation analysis, the goal of this article is to give a reader a flavor of join estimation in SQL Server. The complexity of the CE process is that it should predict the result without any execution (at least in the current versions), in other words it should somehow model the real execution and based on that modeling get the number of rows. Depending on the chosen model the predicted result may be closer to the real one or not. One model may give very good results in one type of situations, but will fail in the other, the second one may fail the first set and succeed in the second one. That is why SQL server uses different approaches when estimating different types of operations with different properties. Joins are no exception to this. 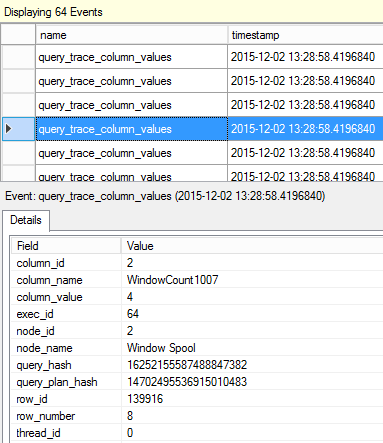 “Does a query plan compilation depend on how busy SQL Server is”. Before we go further, I should explicitly mention that we talk about a Compiled plan, not an Executable plan. Plan execution will of course depend on how busy server is, for example, the query may wait for the memory grant to start execution, or execution may be slow because there are no cached pages in the Buffer Pool etc. However, the question was about a Compiled plan: does the shape of a plan depend on the server load. Sometimes, when I saw expressions like ‘Expr1002’ or ‘WindowCount1007’ or something similar in the columns Output List of a query plan, I asked myself, is there a way to project those columns into the final result to look at the values. That question first came to me out of curiosity when I was playing with window aggregate functions and a Window Spool plan operator in SQL Server 2012, I wanted to look into the Window Spool to understand, how it performs an aggregation. Interestingly, that SQL Server 2016 CTP3.0 allows us to look deep inside into the iterator and observe the data flowing through it. Let’s turn on an “x-ray machine” and take a look. Most of the people know about the so-called “Parameter Sniffing”. This topic was discussed in many aspects in a number of great articles. It is interesting that not only parameters might be “sniffed” during the first execution, but also a runtime constant functions. Let’s look at the example. I will use a test server and administrator account to run the script below, be sure you have enough privileges on your test server if you want to try out the script below. 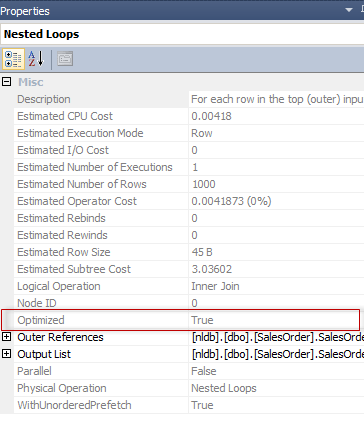 In this blog post, we will look at one more Nested Loops (NL) Join Post Optimization Rewrite. This time we will talk about parallel NL and Few Outer Rows Optimization. For the demonstration purposes, I will use the enlarged version of AdventureWorks2014. 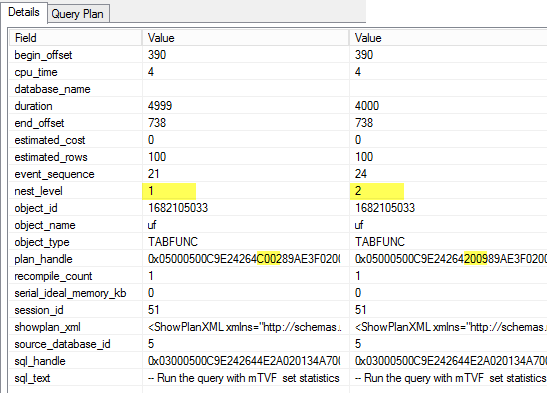 In the sample query, I will also use the trace flag (TF) 8649 – this TF forces parallel plan when possible and is very convenient here, as we need one for the demo. There are also a few other undocumented TFs: TF 3604 – direct diagnostic output to console, TF 8607 – get a physical operator tree, before Post Optimization Rewrite, TF 7352 – get a tree after Post Optimization Rewrite phase. The sample query is asking for some data based on the period’s table. 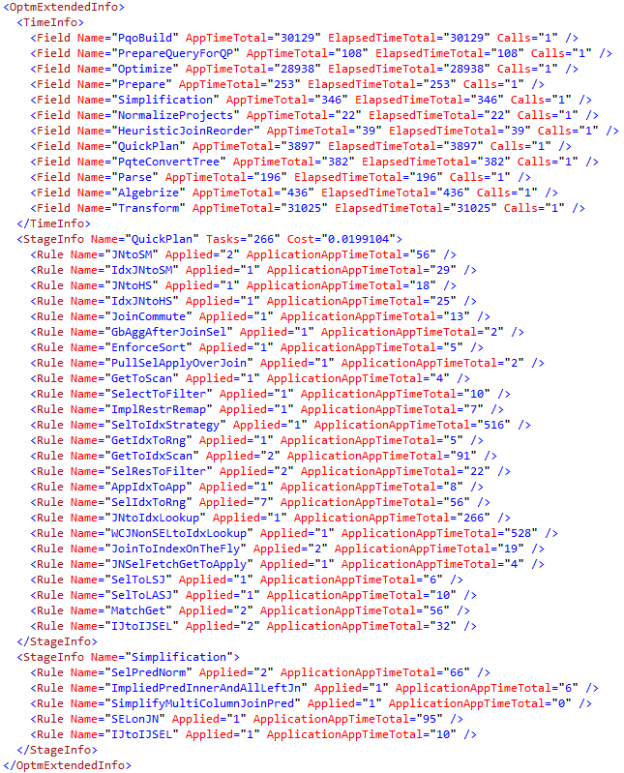 Continuing my blog post series after 24HOP Russia “Query Processor Internals – Joins”. In this (and the next one) blog post, we will talk about the Nested Loops Post Optimization Rewrite optimizations. Some of you may know that Nested Loops join algorithm preserves order of the outer table. Some time ago, on the 24HOP Russia I was talking about the Query Processor internals and joins. Despite I had three hours, I felt the lack of time, and something left behind, because it is a huge topic, if you try to cover it in different aspects in details. With the few next articles, I’ll try to describe some interesting parts of my talk in more details. I will start with Hash Join execution internals. This post is for the “optimizer” fan people. For those who are not afraid when they hear: “query transformation rules”. It this is you and you are interested in the optimizer internals – welcome. This is a note about multi-statement table valued functions (MTVF) and how their cardinality is estimated in the new CE framework. 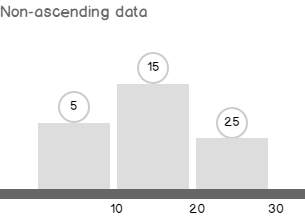 In this note, I’m going to discuss one of the most useful and helpful cardinality estimator enhancements – the Ascending Key estimation. We should start with defining the problem with the ascending keys and then move to the solution, provided by the new CE. 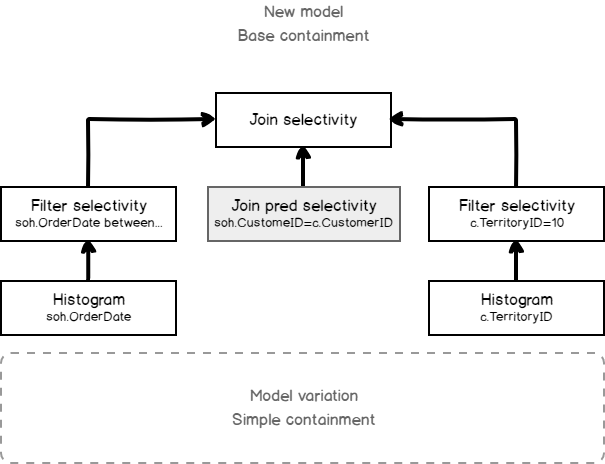 In this blog post, we are going to talk about another cardinality estimation model enhancement in SQL Server 2014 – Overpopulated Primary Key (OPK). Consider a fact table that contains information about some sales, for example, and a date dimension table. Usually, a fact table contains the data about the current year and past years, but a dimension table usually contains the data for the next few years also. 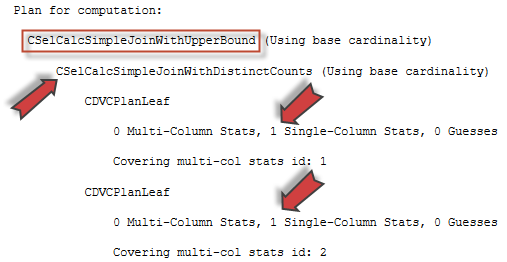 In this post we are going to talk about one of the model assumptions, that was changed in the new cardinality estimation mechanism in SQL Server 2014 – Join Containment Assumption. You may find some information about this assumption in the Ian Jose’s blog post: Query Processor Modelling Extensions in SQL Server 2005 SP1, there you may find the description of the so-called simple assumption and base assumption. Another source of available information is a white paper from Joseph Sack Optimizing Your Query Plans with the SQL Server 2014 Cardinality Estimator. In this blog post, we are going to view some interesting model variation, that I’ve found while exploring the new CE. A model variation is a new concept in the cardinality estimation framework 2014, that allows easily turn on and off some model assumptions and cardinality estimation algorithms. Model variations are based on a mechanism of pluggable heuristics and may be used in special cases. I think they are left for Microsoft support to be able to address some client’s CE issues pointwise. Today we are going to view some interesting model variation, that creates filtered statistics on-the-fly. I should give a disclaimer here. Even though reading execution is technical, it is more an art than science. The main iterator used when joining tables is a Loop. Nested and Merge loops are 2 of the most common. A plan can even have a loop without joining tables when a Seek needs a Lookup to find additional columns. 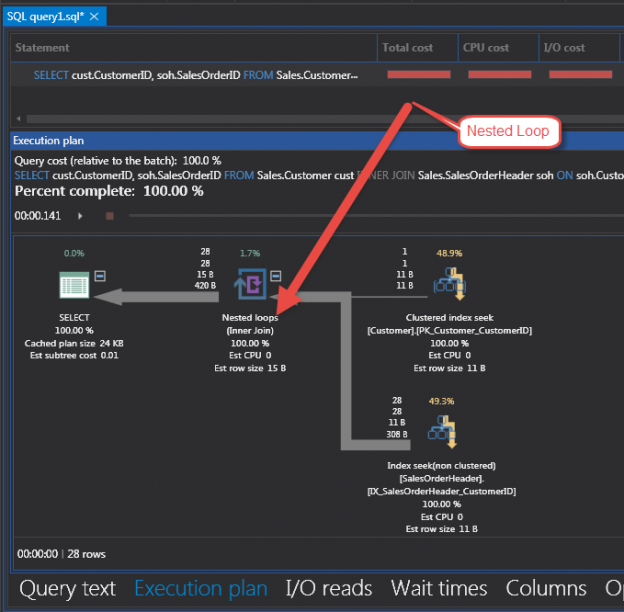 This art of reading execution plan loops can help with performance tuning and debugging T-SQL. Once over the hump of reading a plan, going from beginner to intermediate is simple. This is a small post about how you may control the cardinality estimator version and determine which version was used to build a plan. The version of the cardinality framework is determined by the query database context, where the database has a specific compatibility level. When you create a database in SQL Server 2014 it has the latest compatibility level equals 120 by default. If you issue a query in that database context, the new cardinality version will be used. You may verify this by inspecting the plan property “CardinalityEstimationModelVersion” of the root language element (the one with the green icon), SELECT, for example. In this post, we are going to take a deeper look at the cardinality estimation process. We will use SQL Server 2014, the main concepts might also be applied to the earlier versions, however, the process details are different. The algorithms responsible for performing the cardinality estimation in SQL Server 2014 are implemented in the classes called Calculators. In this blog post we are going to talk about the principles and the main concepts which are used by the optimizer to perform an estimation, and also, we will do a little bit math, so be prepared. A cardinality estimation mechanism, as a first step, usually uses base statistics to estimate the expected number of rows that should be returned from the base table. You may look at these statistics using DBCC command – DBCC SHOW_STATISTICS.